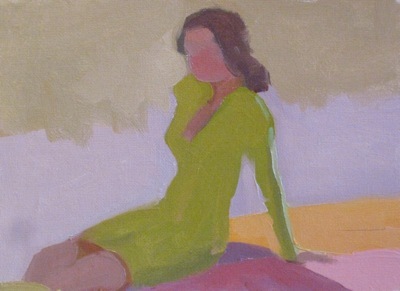 I’ve recently started focusing on the figure, and am having fun with the various approaches that are possible. This little slide show shows the range of ideas I am exploring. Still feeling really challenged by learning the figure. Reminds of a quote by First Lady Eleanor Roosevelt, “Do something every day that scares you.” I need this. I took snap shots as I progressed so I could review with my teacher Al Tofanelli (at l’Atelier aux Couleurs), so he could advise me. 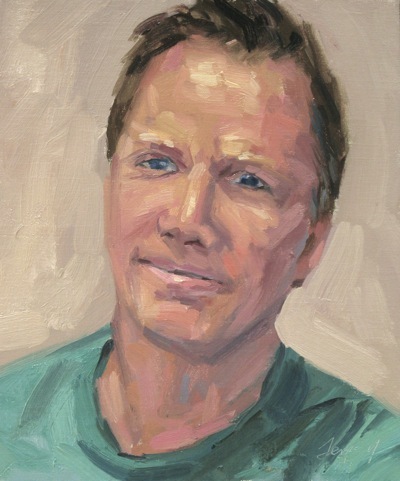 It’s interesting, I think a personal style in portraiture is emerging at a faster pace than landscape. Not sure why. Enjoy! 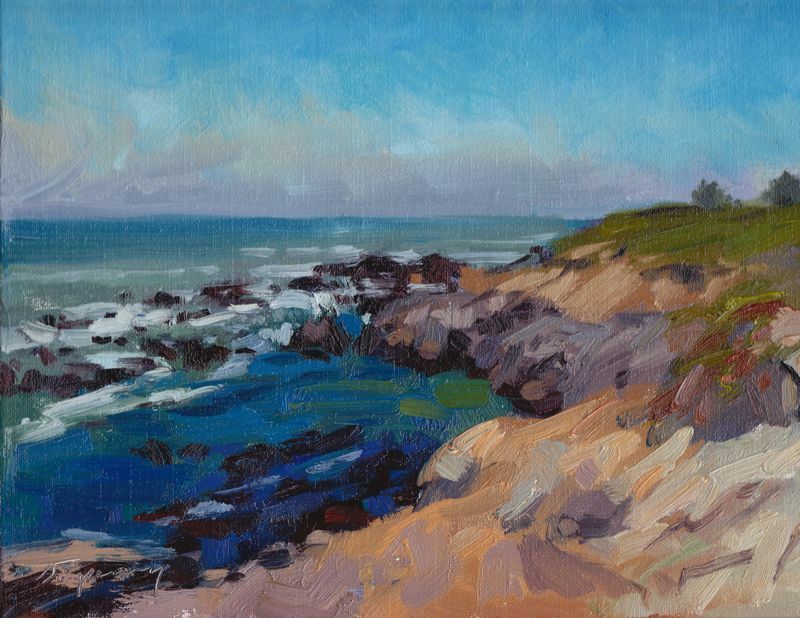 Self-Portrait, Oil on Linen, 12x10"
While painting this seascape the other night, I took snapshots of progress so I could create a demonstration video. I think the process I followed here is somewhat typical, but I always feel free to alter it to meet the needs of the moment. See my YouTube channel for more of my own demos, as well as those by Peggi Kroll-Roberts, John Ebersberger, Kevin Weckback, Mark Kerckhoff, and Skip Whitcomb. These are just vidoes I’ve taken myself, but I also have a more extensive list of demos in my “Plein Air Demos” playlist (over 60). If you have a demo on YouTube that you’d like added to my plein air demos playlist, leave a comment with the video URL. Thanks! I took another shot at this composition, but intended to take the high-key concept further, but failed really. I like the way the painting came out, just felt I could have made it ever more “high key”. I’m going to continue to work on this. I painted a “full key” painting from a reference photo taken at Lake Tahoe this past summer. As soon as it dries, I’ll can it and post, because I think it really illustrates the dramatic difference between low and full-key painting. Today Peggi Kroll-Roberts focused on the structure of the head. 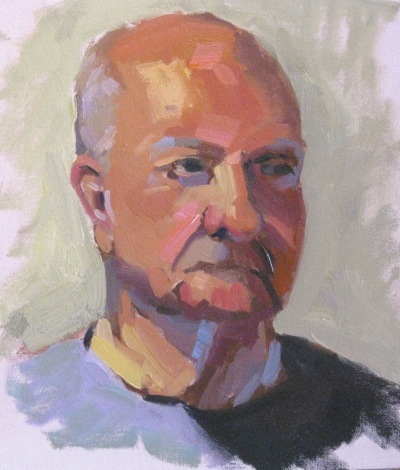 If you think of the head as a structure of planes, it becomes easier to paint. Each plane has a relative size, shape and direction. The direction (facing up, down, towards light, away from light) gives you clues about how it should look. For example, planes that face down towards a green shirt, will have reflected green light; planes facing the sky outdoors, will reflect blue on a clear day. Here’s a video of Peggi explaining her approach, and the measures she uses to structure the head. Peggi will emphasize that these are not rules, but guidelines. The reality is that when you’re facing with a model, they’re rarely going to be facing you straight on at eye level–but you can transpose these rules to heads that are tilted, swiveled, etc. The bottom line is you need to learn to see and draw accurately. There are no short-cuts. Here are my own head studies from the day. So we could focus on fewer variables, the first few studies where done mono-chromatically. By the end of the day, I had time to do one study in color. And finally, a study in color! Be sure to visit at l’Atelier aux Couleurs for a list of upcoming workshops. They have some great teachers! 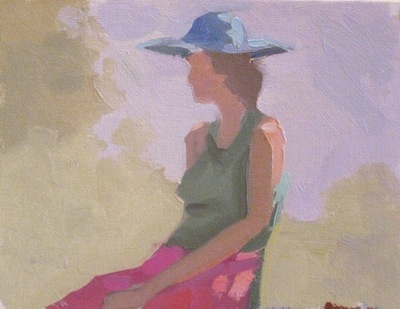 Day 3 of the Peggi Kroll-Roberts workshop at l’Atelier aux Couleurs focused on painting “high-key” paintings. 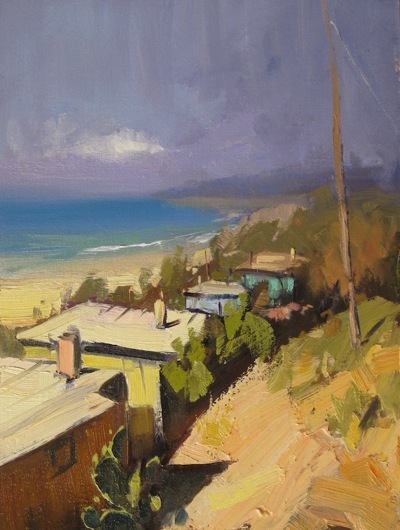 This approach to painting is focused on a narrow range of values at the high end (light) of the value scale. I’ve recently experimented with this approach (here, here). 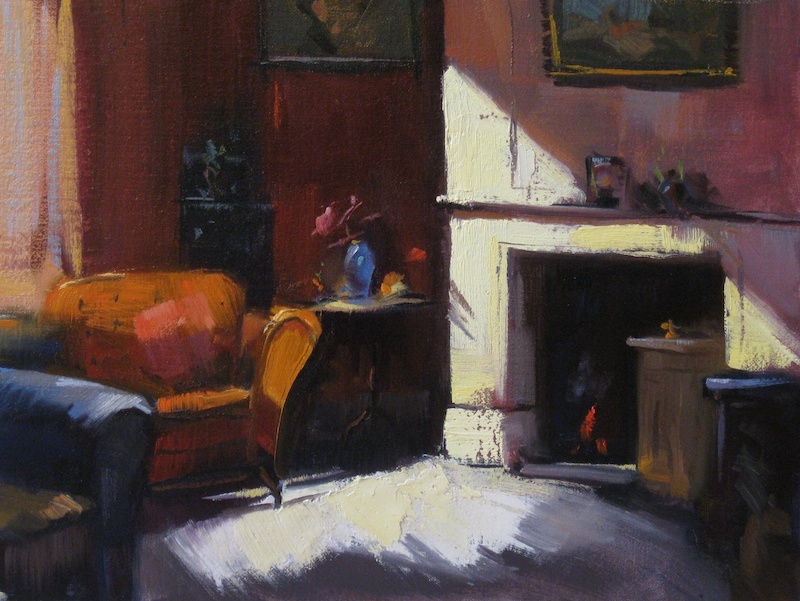 I think it’s ironic that these paintings seem to give a much better sense of light that high-contrast paintings. You’d think that an object painted in near white next to near black would give the best sense of light (and sometimes, it can work), but a high-key painting seems to work even better. I think it’s because the painting overall is much lighter, the darkest shadows are readable and not so dark they loose their vibrancy. So, I have a treat! If you 8 minutes and 49 seconds to spare, I have a full start-to-finish demo of Peggi using this technique in a 20 minute demo. Finally, this isn’t high key, but just a regular “full key” study. 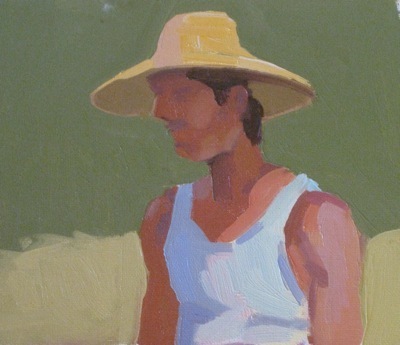 I studied with John Ebersberger this week at l’Atelier aux Couleurs: the Art Academy. John’s a great teacher, full of energy, enthusiasm, and most of all, knowledge. He is from the “Hensche School” painting method, whose lineage goes backward from Henry Hensche (John’s teacher and Hawthorne’s assistant), to Charles Webster Hawthorne (Chase’s assistant) to William Merritt Chase. The main ideas of this school of painting (which is really more of method of seeing) is that 1) form can be modeled with color variation; 2) painting in outdoor light; 3) outdoor light/conditions introduce a “light key” that must be represented (eg, from an overcast day to a full sun day). To give you a practical example of how the school’s differ, a tonalist would mix a shadow color, then add white and a bit of yellow to show the sunlit side, whereas a Hensche colorist would see each color as a completely distinct mix. 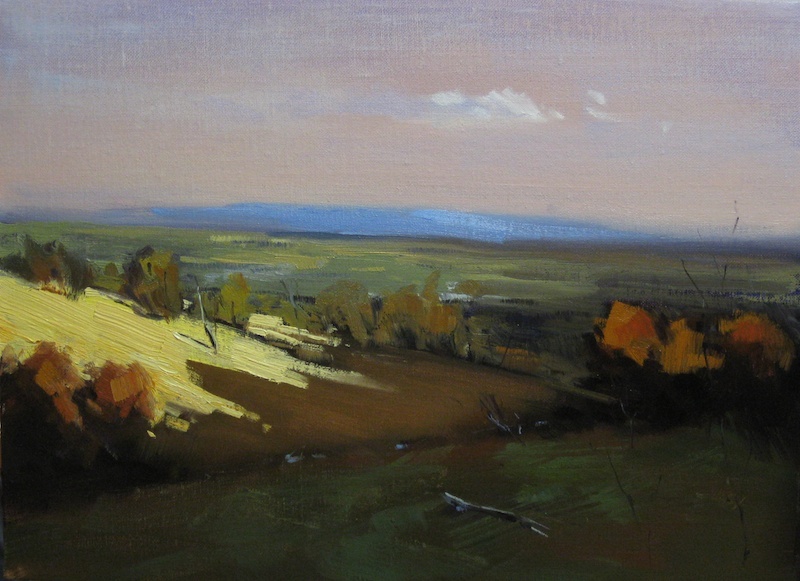 So while a Hensche colorist may turn a form with color and temperature changes, a tonalist (or “value painter”) may do so with value alone (the range of values from black to white). I’ve studied this method under Camille Przewodek as well, and can tell you Henche’s method is not a “one workshop thing”. This is my 3rd, and I feel I’m starting to get it. It takes years of study and practice, and although Camille has applied the technique to plein air painting, I think it’s best learned with outdoor still life study. In fact, if you study with her, you’ll probably spend most of your time painting colored blocks in outdoor light. Sounds boring, but believe me, it’s more challenging than you may realize. In a still life, you can practice with objects and light conditions that are highly varied. To learn more about this school of painting, I recommend joining John’s Facebook group on Hensche, and not bothering too much with the Hensche Foundation website, which does not present his best work and looks quite stale. Here are some of my and John’s studies, along with commentary. I hope you find them useful! If you’ve studied this technique as well, chime in with your feedback by entering a comment on this post. As you can see, John paints with a full spectrum palette of color. If you’re interested in the specific colors, let me know in comments and I’ll list them out [see the update below, all his colors and the brand of paints he uses are listed at the end of this post]. Isn’t this a beautiful start? I missed most of this demo, but was able to capture the end of the start, and where he started to work on refining the large pot. The sides of the pot and the cast shadow on the table are being refined with warm/cool note differences, but he started the pot just as he did the apple, as simply a light and shadow note. I have a video of this on my previous blog post, step-by-step. Notice how the shaded side of the head holds together well, even though there is variation between the hair and skin (the lit side, too). 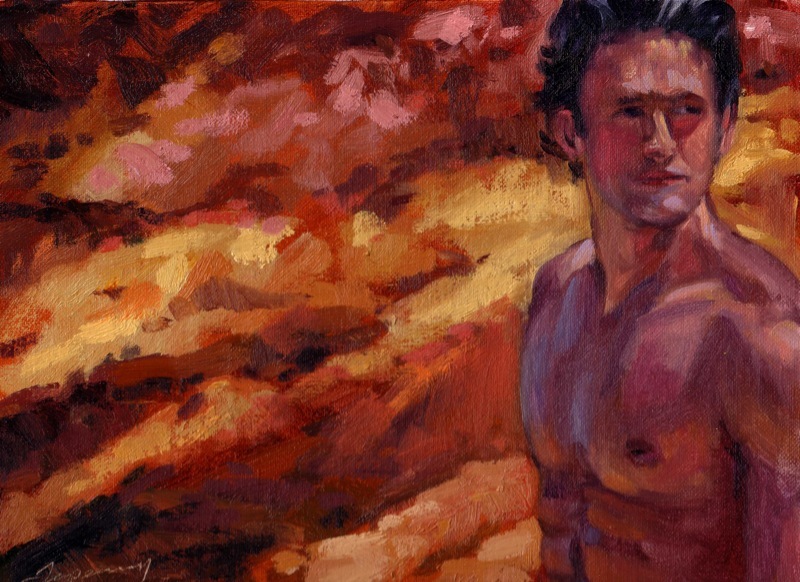 He emphasized this often, that you hold to the large relationships first (figure to background) before you start color variations, and eventually detail. Click here for a YouTube video demo of the figure start above. This was my first attempt of the week. I didn’t have time to finish it, but I’m happy with the start. I do think my shadow notes are dark dark, and I started to work lighter color into them (you can see the darker beneath). I’d also just started to model the blue pitcher and the pear. Notice that I’ve left white space between each color note. This can be confusing at this stage of the painting, but it’s important because it allows me to continually adjust color spots and relationships throughout the painting. If you bring the color spots together too soon, and need to adjust later, you’ll risk creating mud and maybe creating a type of edge that you may not want. I was really happy with this figure study, probably my best of the week! John took a photo too, as he’s collecting examples of studies for his website. I had time (about 2 hours) to get the relationship between figure (face) and background, and just started modeling the hair and forehead. Wish I could have finished this one. Here’s another start from later in the week. 5. Cad. Scarlet (or scarlet lake) — A must for outdoor work (see specific colors listed below, you may also explore reds made with napthol and perylene). Any paint brand is fine to start out with, you will find what works best for you. Ultimately you want to learn what pigments you are using. Some are right in the name – Cadmium yellow is made from cadmium pigment. Some are not in the name, for instance Winsor Newton’s Permanent Rose is actually a quinocridone pigment. Regarding less expensive student brands of paint – when colors are named things like Cadmium red hue, or cerulean blue hue, the pigment is not what is stated in the name – this is not necessarily bad, as some of these pigments are useful. For instance the Cad. red hue may be a napthol, a color with strong tinting strength – and the cerulean hue may be a pthalo, a color with strong tinting capability. Usually I like a warmer and cooler version of each of the primaries and green. Also a small range of earth tones is helpful. 1. The Blockx Cadmium Yellows are terrific for use with palette knife. I use Blockx Cad. Yellow Pale, Cad. Yellow Medium, and Cad. Yellow Deep. 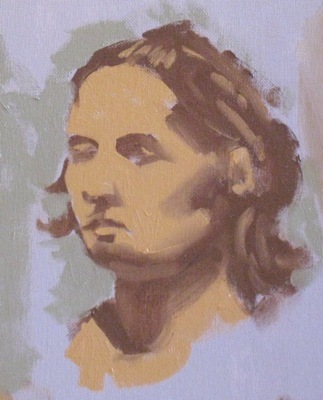 When using a brush, I prefer the Rembrandt line of yellows because they are more fluid. 3. Blockx, Cadmium Red Orange – the brightest red available, on the orange side, similar to cad. Scarlet (a bit thick for use with brush, especially in winter). 6. Winsor Newton Cad. Red Deep – not bright, but you don’t always want bright. Almost a cool earth note. 8. Either Sennilier Permanent Violet, Gamblin Dioxine Purple, or Old Holland, Bright Purple. Also try any of the variety of quinocridone pigmented oils. I still pine for the old Rembrt. Perm Violet and Red Violet! 9. Blue – Still experimenting with brands- right now I use the Rembrandt line – Ultramarine, Cobalt, and Cerulean. I also recommend Manganese Blue Hue by just about anybody, but Gamblin is probably the best deal. 18. Blockx, Yellow Ochre, for palette knife. Rembrandt for brush. 20. White – Gamblin Titanium White. Blockx is excellent as well, but a little stiff for brush work right out of the tube. 21. I almost forgot!! Rembrandt Turquoise and Winsor Newton’s Indian Yellow – two indispensable colors. I’m attending John Ebersberger‘s workshop this week, so been a bit busy. This is my first attempt embedding a video using my new blog software, so hopefully this will work! If you don’t see an embedded QuickTime video below, here for the video posted on YouTube. 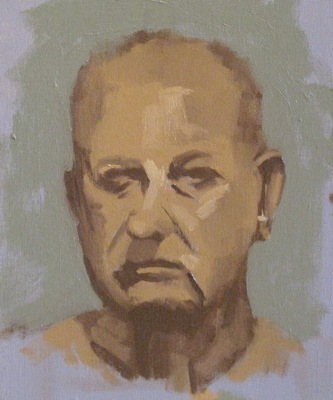 This is a plein air figure painting start by John, referred to as a “mud head” study by the Henry Hensche school of contemporary impressionism. I’ll post my own in a few days, along with additional commentary and information.